Though French artist Hubert Robert’s name doesn’t resonate like those of his compatriots Chardin and Fragonard, in his day he was celebrated for his poetic views of architectural ruins. Robert’s diverse fans ranged from Louis XVI and Catherine the Great to Voltaire and Thomas Jefferson. Co-organized by the Louvre and National Gallery of Art, “Hubert Robert: a Visionary Painter” reintroduces this 18th century artist with some 140 works — beautiful red chalk drawings, painted sketches, engravings, capricci, large paintings, and decorative and garden designs (Louvre, Paris; March 9 to May 30; National Gallery of Art, Washington, D.C.; June 26 to October 2). Installed below the Louvre pyramid in Napoleon Hall, the monographic exhibition is a fitting homecoming. From the late 1770s, Robert was ‘Keeper of the King’s Pictures’ and lived under the Grande Galerie. After the French Revolution and his release from prison, Robert helped turn the Grande Galerie and other rooms in the former royal palace into picture galleries. Organized chronologically, the show retraces Robert’s long, successful career, starting with his formative decade in Rome. The young Parisian arrived with a powerful patron — the Duc de Choiseul, France’s ambassador to the Vatican, who employed Robert’s father as his valet. While studying at the French Academy under Giovanni Paolo Panini, Robert met Jean-Honoré Fragonard with whom he traveled to Herculaneum, Pompeii, and Villa d’Este in Tivoli. Robert also befriended and sketched with Giovanni Battista Piranesi. Returning to Paris in 1765, the witty, convivial artist found an avid audience for his painted architectural views and interior designs. Among Robert’s decorative works were scenery for a royal theater at Versailles and for Voltaire’s theatre at Ferney in Switzerland. His huge decorative cycles graced chateaus and palaces in France and Russia. Several pieces of furniture Robert designed for Marie-Antoinette’s dairy at Rambouillet are also on view. At the same time, Robert helped popularize the French Landscape Garden, an off shoot of the popular English style garden. Robert collaborated with Marie Antoinette’s architect on an informal landscape for the Petit Trianon at Versailles. Other landscape projects include financier Marquis de Laborde’s Méréville and René Louis de Girardin’s Ermenonville. Robert was hugely popular with Russian aristocrats. Smitten with Robert’s inventive views, Catherine the Great tried several time to lure him to St. Petersburg. With Paris engulfed in chaos, the tsarina wrote her art agent that the famous painter of ruins was unlikely to leave France when surrounded by his favorite subject. Accused of royalist sympathies, Robert was imprisoned for ten months at Saint-Lazare, during which time he managed to turn out nearly 50 watercolors and drawings of prison life. Released in 1794 after the fall of Robespierre, the 60-year-old was appointed to the Conservatoire, a group supervising the Louvre’s remodel from royal palace to national art museum. While working at the Louvre, Robert produced several dozen views of restoration projects, most famously Project for the Transformation of the Grande Galerie of the Louvre and Imaginary View of the Grande Galerie of the Louvre in Ruins. Among the last works bought by Catherine the Great before her death, the canvases would be acquired by the Louvre in 1975. The first depicts Robert’s plan for transforming the corridor of Louis XIV’s sumptuous palace into a public art gallery. Below a skylight and coffered vaults, spectators stroll through an elegant gallery, admiring Italian masterpieces formerly from the royal collection. To the right foreground, Robert added himself at an easel, copying from Raphael’s Holy Family. In Robert’s futuristic Imaginary View of the Grande Galerie of the Louvre in Ruins, the proposed gallery is destroyed, emptied of masterpieces, its famous statuary in pieces. In the middle of the decay, an artist sketches the only surviving artwork, the Vatican’s antique sculpture Apollo Belvedere with a bust of Raphael at its feet. Opening at the NGA in June, the retrospective will be reconceived with some 50 paintings and 50 drawings, including many in the artist’s favorite medium, red chalk against white paper. One of his Rome sketchbooks from 1763-64 will also be on view, on loan from the Morgan Library. Few of the decorative panels Robert produced for the drawing rooms of stately homes have survived in their original settings. Four of his large paintings of ruins from the Chateau de Méréville, from the Art Institute of Chicago, will fill one of the galleries. 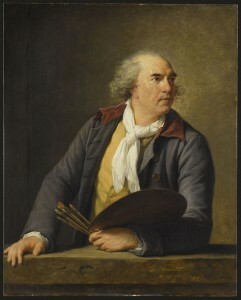 According to Hubert Robert’s friend, portraitist Élisabeth Vigée Le Brun, the artist died in 1808 with a paintbrush in his hand.